This week I decided to celebrate the birthday of the United States of America with some truly patriotic beer, even though this article won’t see the presses for a couple of weeks. Last year I celebrated the Fourth of July with one of the few truly American beer styles, the double IPA, but this year I wanted something a bit different. After browsing the shelves for a bit I finally found what I was looking for: Yards Brewing Company’s Ales of the Revolution. 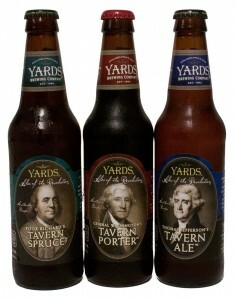 The Ales of the Revolution series consists of three beers: General Washington’s Tavern Porter, Poor Richard’s Tavern Spruce Ale and Thomas Jefferson’s Tavern Ale. General Washington’s and Thomas Jefferson’s are crafted from recipes recorded by their namesake, while Poor Richard’s Tavern Spruce Ale is a somewhat more obscure nod towards Benjamin Franklin and his Poor Richard’s Almanac. The General Washington’s Tavern Porter poured a dark black, with traces of blood red highlights around the edges where some light made it through. As dark as it was, though, it appeared to be quite clear, likely due to filtering, and only a thin ring of light tan bubbles formed around it the edge of the glass. The aroma was surprisingly sweet, consisting of an interesting, plummy coffee. The beer was medium bodied with moderate carbonation. The taste had a sweetness underlying a nice coffee character. The bitterness level in this beer was significant, but was probably enhanced by the slightly burnt and astringent character of the kilned malt that gives it its color. The original recipe for this beer calls for molasses to be used as an adjunct to the barley, and that definitely comes through as the sweetness in the finished product, as the yeast wouldn’t be able to ferment all the complex sugars present in the molasses. The Thomas Jefferson’s Tavern Ale poured a clear, golden red with two fingers of pillowy, off-white head; the head and the lacing it left behind reminded me very much of a Belgian beer. The aroma was very sweet, with a beautiful orange citrus character to it. The body was moderately thick, which was enhanced by the low carbonation. The taste was surprisingly sweet as well, with a nice orange layered on top of a solid, biscuit-y malt backbone with some random hints of plum thrown in. This was a very, very smooth beer, and the original recipe includes both honey and rye. The Poor Richards Tavern Spruce Ale poured a clear dark brown with golden highlights, forming almost no head. The aroma was virtually non-present, but I did detect a very faint sweetness. The beer was fairly full bodied, and the taste started sweet, but finished dry. There were hints of plum floating around the sweetness of the malt, which accented nicely with the spruce. The spruce has a slightly bitter bite to it, and it’s what seems to give the dry finish. The Tavern Spruce once again used molasses as an adjunct due to the cost of barley at the time. The spruce in the name comes from the substitution of spruce essence for hops in the original recipe; I didn’t notice much of that in this particular beer, but I have had it on tap at City Tavern before, and it was much more forward on that occasion. I actually enjoy the use of bittering agents other than hops, so this was quite a treat for me. I personally thought all of these beers were excellent and would definitely recommend giving them a try. They are all slightly sweet compared to modern beers, overall reminding me a bit of Dogfish Head’s products but are also more balanced than Dogfish Head’s and gain their sweetness through the use of the period-correct molasses and honey adjuncts. Overall, though, they were very good, and I will probably buy a case of these in the future.